Search engines such as Google crawl, parse and index websites along the lines of keywords and the respective URLs. Despite the rise of deep learning algorithms and certain experts claiming the death of keywords, keywords are very much relevant. SEO keyword research is an important part of the content creation process. How would you feel spending hours writing a blog or a web copy that will generate no site visit? I bet this will be frustrating and lead you to question the relevance of content marketing. An in-depth keyword research is usually carried out before contents are created to ascertain search volumes and competitiveness. Very recently, Google made certain changes to its popular Keyword planner. 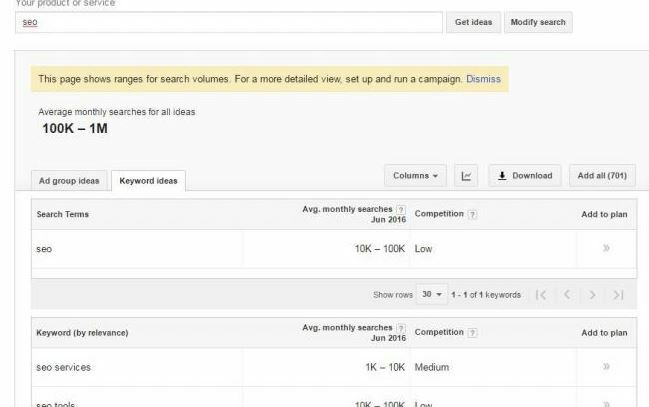 Google displayed keywords in ranges to low spending AdWords accounts with this example adapted from Search Engine Land. The keyword forecasting tool is not affected by these changes at the time of writing this blog. Here are some interesting insights about how Google is grouping similar words in its Keyword Planner tool. Keywords are grouped by hyphenated and non-hyphenated variants: I was running an experiment a few minutes ago to ascertain if Google generates the same search volume for a hyphenated word and its non-hyphenated counterpart. The outcome is that a word like ‘bake-off’ and ‘bake off’ have the same search volume of 33,100. Keywords are grouped by stemming and root words: Stemming, in this case, refers to words that originate from a relevant root word. I ran a search on the Keyword Planner for a root word ‘dive’ and the search volume was 135,000 and afterwards, a search was made for a stemmed word ‘diving’ and it returned the same search volume. As such, getting worked up over optimising a site for the root or stemmed keyword is a bit unnecessary but paid keyword tools like that from Moz make attempts to split the search volume from root words and their stems. Using the ‘bake-off’ and ‘bake off’ example from the Moz Keyword Explorer, it clearly indicates that there is a search volume for ‘bake off’ but none for ‘bake-off’. Keywords are grouped by abbreviations and their full form: Keywords are also grouped based on their abbreviations and full form and a good example of this is UNO and United Nations Organisation. I ran a search for both variants and the search volume was the same. Hence, it is safe to say Google combines the searches for both the abbreviated and non-abbreviated formats. Keywords are rounded up to the closest bucket: The search volumes on Keyword Planner are rounded up to the closest bucket. I ran a search on David Haye and it returned 165,000 monthly searches which are a rounded figure. The next bucket above 165,000 is 201,000 and the actual search volume for ‘David Haye’ is much closer to 165,000 than 201,000, hence the present search result. The team at Moz analysed a massive dataset to realise that Google has around 85 buckets and this formed the premise for the above analysis. Google Keyword planner is one of the most robust keyword tools in the world due to the pool of data available. The above groupings give you a bit of an idea on how keywords are grouped and search volume aggregated. Keywords are an integral part of your SEO strategy and understanding the process of finding the gem words is not just important but golden.